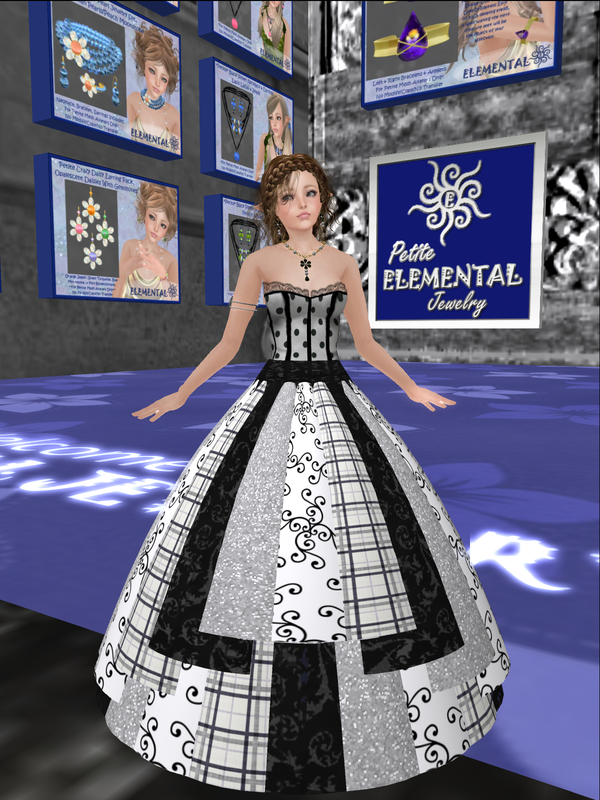 Elemental ~ Jewelry With Substance: My Petite Is Wearing A Bargain! Well, fellow petites, the Petite's Shopping Village has moved to a new, larger location. (Can you guess where I'm standing?? LOL) You may already know about the mall, but did you know that the grand opening is this weekend? That's right--entertainment and sales! That's a good thing! The entertainment will be Saturday night at 6 pm slt, but the sale will be all weekend. Not only is there the usual 45L Weekend Sale, but many of the shops at the new mall will have other sale items--those shops, including PETITE ELEMENTAL JEWELRY, will all be marked with a big banner. Here I am wearing my 45L Weekend special, and I think you will like it. It's the Petite Floral Elegance Necklace & Earrings in pearl and black onyx. You can find the special at the PETITE ELEMENTAL JEWELRY mainshop, or at the satellite shops at either the Petite's Shopping Village at Cavettaz or at the ~Petites~ Village Mall at Holiday Village. And...the lovely dress I'm wearing is also in the 45L Weekend Sale! You can find it at Just Winging It at the Petite's Village Mall (the one with the grand opening) right next door (how convenient!) to PETITE ELEMENTAL JEWELRY. This is my friend Moonbeam Jillybean's shop, and she has many cute items for petites at fantastic prices, so be sure to have a look. I think this black and white beauty is her best effort yet! Go Jilly! Jewelry: PETITE ELEMENTAL JEWELRY--Petite Floral Elegance Necklace & Earrings in pearl & onyx. Dress: Just Winging It--Beaux Arts Faerie dress in black & white. This was a gift. Hair: Emo-tions--Dina in naturals. This is big girl hair, but it shrinks right down to fit your petite. Gorgeous! Purchased at full price. Location: The new Petite's Village Mall at Cavettaz.